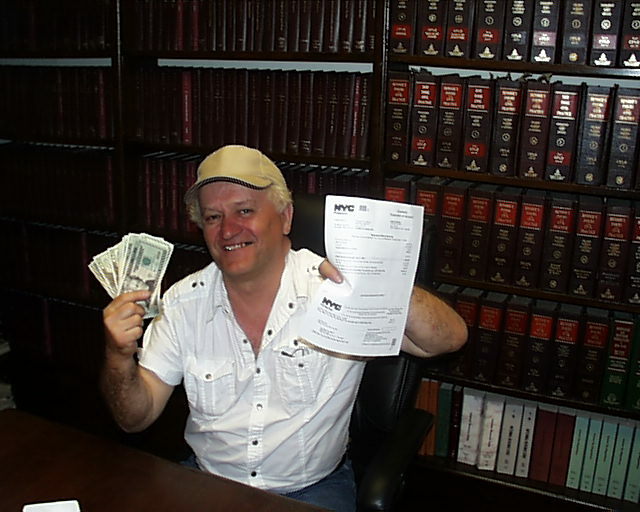 A Happy Taxpayer Mircea Fersedy pay his taxes dispite being illegally removed from his home and his social security check being held by the Jewish Association for Services for the Aged. Fresedy was assualted by JASA workers Lisa Bednarz and Sandra Allen-Simms social workers last month outside UJA headquaters on 59th Street in Manhattan. Sandra Allen-Simms struck Mr. Fersedy in the head and shouted. "I'm not afraid of you. I'll marshall your Social Security check..."
Guess holding Mr. Fersedy's check hostage did not stop Fersedy from paying his taxes. Ms.Cecille Hershkovitz, Ms Bednarz and Ms. Allen-Simms you will have to find a legal way to obtain Fersedy's house. Why not call a Realtor for assistance? Please contribute to Mircea Fersedy's Legal Defense Fund.